“Elevation” was the third single relased to promote “All That You Can’t Leave Behind” and it was also doing double duty as the lead single to promote the soundtrack to the “Tomb Raider” movie. It was also being used to promote U2’s tour of the same name. The song was remixed for the movie soundtrack, and it was that remix that was used for the single, and additional remixes were completed and the single was highly marketed towards DJs as well as traditional routes. In the UK, two different 12-inch vinyl promotional singles were issued each in a unique sleeve. The red version of the single contained “Elevation (Escalation Mix)” and “Elevation (Influx Remix)” while the blue version of the single contained “Elevation (Paul Van Dyk Remix)” and “Elevation (The Vandit Club Mix)”. In Germany a 12-inch single was released in a generic white sleeve, containing the same tracks that the blue-covered UK promotional single had. And in the US a 12-inch single was released in a generic black die cut sleeve, which had been stickered with the contents of the vinyl – this release contained three tracks, “Elevation (Escalation Mix)”, “Elevation (Influx Remix)” as well as “Elevation (Quincey and Sonance Remix)”. A number of 5-inch promotional CDs were issued around the world as well. In the UK, there were two pressings of the CD for use, the first contained an image of “Lara Croft” on both the CD and the front cover. There were some issues with use of that image, so a second CD was issued with the same exact art, but used images of U2 in the same spots that had previously held images of “Lara Croft”. Both of the CDs contained one track, “Elevation (Tomb Raider Mix)”. In the USA there didn’t seem to be any problem with using images from the movie and a three track promotional single featured an image of “Lara Croft” on the cover. 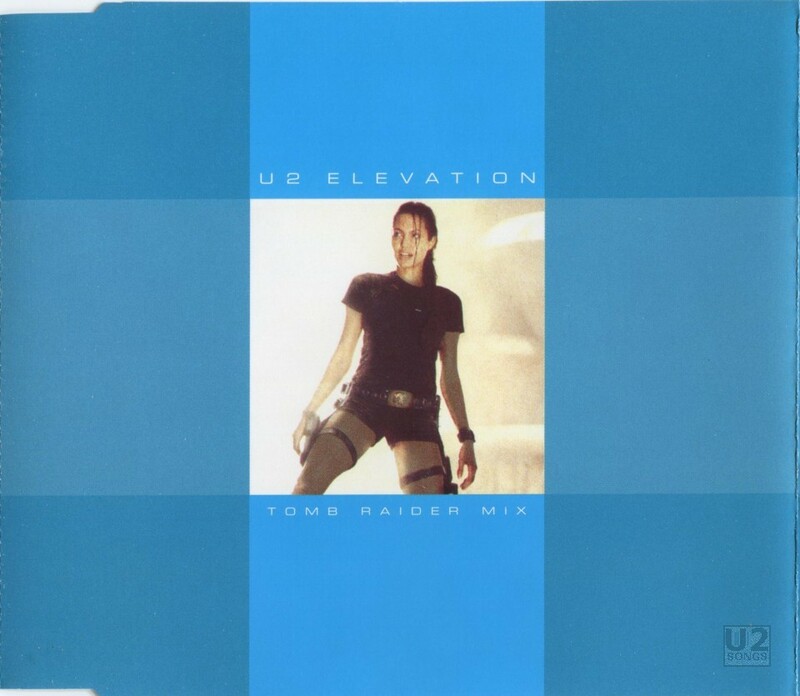 The tracks contained on this three-track promotional single were “Elevation (Tomb Raider Mix)”, “Elevation (Biffco Mix)” and “Elevation (Album Version)”. A second promotional single in the US came in a regular jewel case but only with a plain back insert. That version contained just the “Album Version” of the title track. And in Mexico a 5-inch CD was also released in a generic sleeve, featuring a number of mixes of the title track including the “Album Version”, “Tomb Raider Mix”, “The Biffco Mix”, “Escalation Mix” (Wrongly labeled as the “Escalator Mix”), “Quincey and sonance Remix” and the “Influx Remix”. A number of fairly generic looking CDR promotional CDs were released as well with the CD being housed in a plastic wallet with a paper insert. Most of these were produced for the UK. One, contained a number of remixes by Paul Van Dyk, some of these mixes not appearing on other releases. That particular release was dated June 25, 2001, and contained the “P.V.D. – Radio Mix”, “P.V.D. – Remix”, “Vandit – Club Mix” and “P.V.D. Non Vox Remix”. Another of these generic promos, dated May 16, 2001 featured mixes including the “Tomb Raider Mix”, “Biffco Mix”, “Escalatory Mix”, “QUincey and Sonance Remix” and the “Influx Mix”. In Germany there were also a number of promotional releases on CDR, and these were released in a slimline jewel with a white paper sleeve with information about the release. The first of these included the “Biffco Mix” and the “Influx Mix” and was labeled “Broadcast Quality” on the front in silver emboss. The second disc contained “Paul Van Dyk Remix” and the “Vandit Club Mix”, and two versions of this circulated, one with the embossed “Broadcast Quality” on the front of the sleeve, and one without. Music by U2. Lyrics by Bono. Synthesizers by Brian Eno and the Edge. Produced by Daniel Lanois and Brian Eno. Engineered by Richard Rainey. Assisted by Chris Heaney. Original mix by Tim Palmer. Assisted by Alvin Sweeney. Additional production by Chris Vrenna. Mixed by Paul Leary at Enterprise Studios, Burbank, CA. Music by U2. Lyrics by Bono. Synthesizers by Brian Eno and the Edge. Produced by Daniel Lanois and Brian Eno. Engineered by Richard Rainey. Assisted by Chris Heaney. Original mix by Tim Palmer. Assisted by Alvin Sweeney. Remix and additional production by Jon Carter for David Dorell Management. Music by U2. Lyrics by Bono. Synthesizers by Brian Eno and the Edge. Produced by Daniel Lanois and Brian Eno. Engineered by Richard Rainey. Assisted by Chris Heaney. Original mix by Tim Palmer. Assisted by Alvin Sweeney. Remixed by Quincey and Sonance. Scratching by Kato. Additonal production by Phil Johnson. Music by U2. Lyrics by Bono. Synthesizers by Brian Eno and the Edge. Produced by Daniel Lanois and Brian Eno. Engineered by Richard Rainey. Assisted by Chris Heaney. Original mix by Tim Palmer. Assisted by Alvin Sweeney. Additional production by Richard “Biff” Stannard and Julian Gallagher. Mixed by Ash Howes at Biffco Studios, Dublin. Scratching by Ben Chapman.